What is the work of best kayak fishing life vest? If you fall from the boat or kayak, it will afford you the ability to keep your head above water so that you can breathe. You can never deny that you adore water and you want to be near to water so much. Whenever we are free we take water voyage and if you are enough adventurous then you may prefer going fishing tours or excursion on the boats or kayaks in any deep lake or sea. Remember that WATER IS NOT YOUR BEST FRIEND! It may take you interesting trips but you shouldn't trust it much as it may bring damage to your life. Accidents do not come after an alarm, so better safe than sorry! You have to take preparation for your protection. The best way to ensure the basic protection of you and your family is to wear life jackets or vests. Let us go through the kayak life vest reviews and recommendations! You will get water safety along with utmost comfort with this Stohlquist PFD which is considered as best kayak life vest. This will provide you with excellent cockpit management. You would get a range of pockets for keeping your extra gears. These pockets are zippered and have anchor-point. The shoulders are padded with Neoprene. The new Gaia and ultra-soft floatation foam will ensure your comfort zone. It has a front mounting tool. Pockets of this vest are constructed with EVA. The inner has an option of the fold-down feature. The velour is of hook-and-loop style. Kayak fishing anglers, this one is for you! For any extended water tours, this vest is a baby! This is not only for usual fishing but is also said to be one of the most famous fly fishing life vest. The lower back is made of mesh which has a great fit on the high back-seats. Whenever it is war, these will afford you ventilation. The front entry design is roomy and has eight adjustment points to fit your ideally. For clipping on the forceps or line snips, a retractor of coil tool is there. Has D-ring on the very back along with a loop holder for any low light condition. Are you searching for something that is lightweight still saves you? Yes, you can go for this vest by Onyx. The floatation foam is really soft and enough lightweight which makes it comfortable for the users. For visibility, this life jacket has reflective material that is of SOLAS grade. Pockets are zippered and expendable. They also have mesh drainage system. The construction material is Nylon and it also consists of the lash tab for your extra accessories. On the back, it has got a drying look and includes a whistle for your protection. Both on the back and front there is a facility of ventilation. This a vest perfect for any calm and inland water. Fishing with this Astral Life vest will be one of a kind! For recreational paddling or touring, especially for kayaking, this life vest is an ideal one. This is one of the most popular inflatable kayak life vest in the market. The chest size of this vest is available in 3 sizes; small, medium and large. The small size refers to 31-37 inch, the medium size refers to 38-44 inch and the large one refers to 45-51 inch. The front is zippered in the center. It has high back seats for perfect fitting. For eliminating excessive heat and for maintaining a comfortable core temperature, this life vest has the incredible AIRESCAPE AIRFLOW SYSTEM included. With a deep V neck design, this Adventurewear is a perfect solution for any kayaker. It has got soft panels along with wrap-around foams that can fit any wide range shape of the body. So whatever your size is, no more worries. It also has adjustable shoulders to fit you properly. The front part is zippered and it includes eight different points for adjusting it perfectly with your body. This best kayak life vest will be the best choice if you bear so much gear with you. There are also two mesh pockets which are also zippered and can bear your extra gears. It is constructed with polyester shell fabric and has reflective trim so that it can provide ultimate safety. This Stearns Classic Series vest is a perfect kayak vest to fit on anybody. This model is available in universal sizes. For the usual weight of an adult, this models brings up an Adult Universal size which has a chest of 30 to 52 inch. For the oversized people, this model has a vest which has a chest of 52 to 62 inch. The construction is made of Nylon which is durable. There are also three designs for the buckle is available. The sides are open. If you are up for a Coast-Guard Approved kayak fishing vest then this is all you can ask for! Moreover, if you want a women’s kayak life vest then this is the one! This is a PFD which is approved by the USCG and is just perfect for swimming, tubing, wake sports, and kayaking. This has a minimal bulk design and it allows full mobility to you. The coating is of the Polyester shell which is durable. The exterior is sturdy and the construction is of Polyethylene which makes it lightweight. The used foam is comfortable and soft for relaxation. It adjusts most of the body types. Do you want a women’s kayak life vest then O’Brien is the best brand! The construction material of the outer body of this O'Brien is made of Neoprene for comfortable fitting. The front closure has a zipper and also includes two belts. It concludes multi-hinge points on both rear and front. This is also Coast-Guard approved which has wide armholes. It has a side release buckle that can make donning and doffing faster than ever. This kayak fishing vest by Hobie is the proper vest for the oversized people. People who are tensed for being oversize, forget it. This vest can hold your excessive properly and will fit into your oversized body ideally. According to the kayak life vest reviews, this is perfect if you are a little weight and it is named as XXL and goes with any of the people who bear the size of XXL. The inflation method of this fishing vest is manual which will afford you swimming, intentional immersion and wading without any activation. It is designed for people of or more than 16 years. Are your kid up for going to water rides? Onyx is here to serve you with the ideal kid kayak life vest named Infant General Purpose Vest. This kayak vest has got a pop-up pillow with it and also includes grab strap so that it can star quick recovery. Not only shoulder straps but this jacket contains leg straps for the ultimate safety of your child. Infants that weighs from 30 lbs to 50 lbs can adjust with this life jacket. This is a type III PFD and perfect for kayaking. It also has type II for the children. It also has Youth General purpose life vest that goes with an adult of 50 lbs to 90 lbs. The Division of Boating and Waterways of California State Parks reported that in the event of the year 2009 after the boat capsized, 67% people on board drowned. Among the drowned people the percentage of not wearing life jacket was around 84%. So now you can guess how important it is to wear a life vest when you're on the water. Not only as you life saver but these life vests also work as comfortably designed wears along with effective features and various colors. You cannot purchase life jackets every day or every month, so when you buy it for once, you have to invest your money wisely. You have to go through the basic conception of ideal life vests for fishing and let us guide you through it. You surely have about unsuccessful rescues of life jackets. And according to stats, these are the outcomes of faulty life vests. So, we recommend you using Coast-Guard approved vest for every water journey. Just because of your carelessness, do not be a part of the statistics. Give importance to your life and your life vests to ensure safety. In ice fishing, you always need to wear an ice fishing life vest but most often they fail to afford you utmost protection. The PFD that is Coast-Guard approved is usually reliable and entirely safe. These are manufactured and constructed under the approval and supervision of experts of water life. Their work is to assure that these life vests are not likely to fail. The adjustable kayak vest is recommended an will definitely be ideal for you as they are considered to be versatile. They will afford you exact fittings and in the case of kids and small-bodied anglers, they can be customized. The freely flying vests can be disastrous for you and may cause dangerous accidents. We will also put high effort on using Personal Floatation Device or PFD along with belts that have adjustable feature. With these, you will get the opportunity to tighten the jacket as per your desire. This is much protected in terms of ensuring the user remains afloat. Do you remember the infamous orange fishing life vests? Are they still on top? No! Now the world of life jackets is more colorful. The new and multi-colored life vests have overshadowed the previous orange life jackets lately. In the market of the 21st century, you will surely find everything that you are desiring in your life jacket or PFD. These jackets are not only here to save you rather they will make you look good with their new designs and your pictures will be better than ever. These are available in reflective and bright colors. Camouflage colors and so many other favorite shades are also available to add color to your journey. The type of your life vests for fishing basically depends on your age. Though, we will advise not to take the small kids when you are visiting any unpredictable water. If you have to visit water with the kid, you need to ensure the security of your child. To keep them secure, you will need to provide them life vests that will fit them perfectly because if anytime your kayak capsizes you will be able to keep them afloat. Moreover, your age and gender will always determine your weigh to some extent. To be clearer, most of the kids usually weigh around 25 pounds to 50 pounds and adults weigh over 100 pounds. So in this way you can decide which vest you should go for. This will say that why the respective vests differ in the buoyancy and weight capacity. We know that different people have different physiques and everyone cannot wear the same fittings at all. Usually, kayak fishing life vests of these days are designed with universal fittings so that anybody of any height and weight can wear them with comfort. If you do not know the body size of the angler or several people are going to use the kayak fishing jacket at several times then you can undoubtedly settle on the PFD which has a universal fit and will suit most people of any physique. There are also life vests that vary from size to size. The small life vests are usually of 28 inches to 32 inches; the medium life vests are of 32 inches to 36 inches; and the large life vests for fishing are of 40 inches to 44 inches. Depending on what suits best on you, select any of the sizes to safeguard yourself when on the water. If you are not in any commercial vessels then you cannot operate any watercraft without life vests. Every person of the watercraft will have to wear the wearable PFD of type I, type II or type III. You are also required to keep one throw-able PFD of type IV. No children can ride the vessel without a life jacket. If you are riding personal watercraft in Ohio, then you are also required to wear life vests. In this case, you are bound to wear a Coast-Guard approved life vest. No matter what, your life jacket should be in good condition and of appropriate size. What kind of life vest should I use on a kayak? There are available life vests in the market from where you can select the ideal kayak life jacket for you. 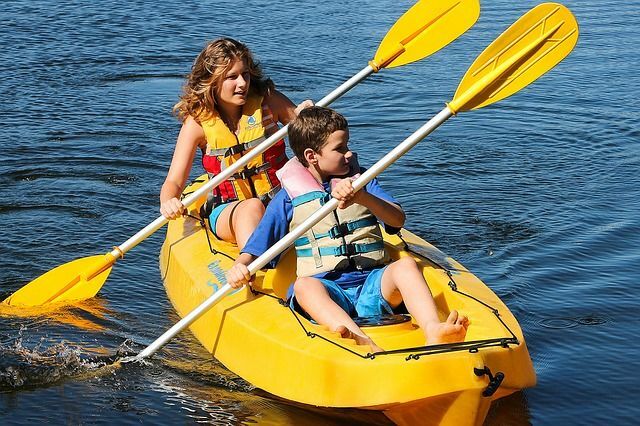 The available jackets or PFD are named as type I, type II, type III, type IV and type V.
Kayaking is an activity where you will be required to do so many physical activities. Moving in the kayak already is tough and when you are with a life vest, it will get tougher. All the types of PFDs will not go with the easy physical movement that you need while kayaking. If it is about kayaking then we will suggest you go for the Type III fishing life vest. These will not only rescue you but also will complement the physical activities you will be doing on the water. Fishing will be easier with this type of rescue vests. How to wear kayak life vest? Firstly, check out the placard of your life vest to ensure that it can hold up your weight. Secondly, open the front part of the life vest and then put the arms through the vest. If it includes a collar to keep your head afloat then it must hang down the back of your vest. Now zip the front part. In some cases, especially in terms of inflatable kayak life vests, you will find a plastic buckle. If you get it then you have to fasten in. Some zippers are protected by hook-and-loop. Close to them. Make sure that it fits appropriately and is not too tight or too loose. Pull the webbing straps to tighten it or if you need then make it a little loose. You are done! What is the best life vest for kayak fishing? The type I PFD is for offshore open water along with remote areas and rough seas. These are the PFDs that you should be when you're away from the rescue boats and are designed to wear for a long time. Type II is for you if you are kayaking in calm and inland waters. Wear these vests where you are able to call rescue boats easily. The type III is ideal for kayaking as they are made for easy movement in the water. When you're fishing with a kayak you have to move your hands and body for a better outcome. Calm and in-land water is best suited for these jackets. Type IV is a throw-able life vest. These will turn into a floating cushion or form a ring which will save you from drowning. Type V is a combination of the features of type I, II and III. These are PFDs that can be customized. We will recommend you going for the type III if you want a good fishing day doing kayaking and safeguarding you and your family. Everyone will agree on the point that every kayak life jackets which can line the shelves are not authentic and will not ensure the highest security. It is not also possible for you to buy every branded life vests to check out which one is ideal for you. So, as your guide, we are here! We have gone through the best kayak fishing life vest and kayak PFDs of the market personally and selected a specific number of models for you that will provide you utmost protection with no worries at all. Go through the subsequent reviews and recommendations of the products along with the proper guide. We are always here to gift you with the best suggestions we ever can!